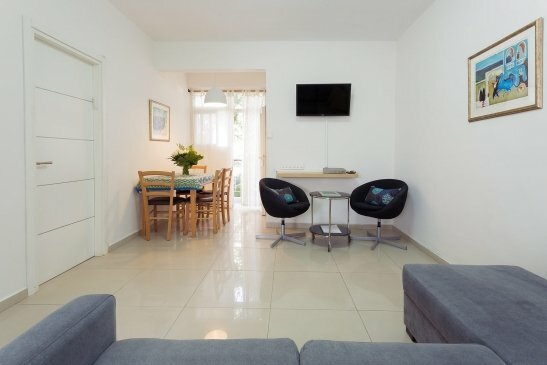 The Colony is a comfortable two bedroom apartment, suitable for travel companions. The apartment can host up to six guests. This two bedroom apartment has a sleeping capacity for up to six guests. Located in a leafy side street, the apartment enjoys long hours of natural sun light. There is a fully equipped open plan kitchen with separate dishes for meat and milk utensils, four electric stove tops, a full size fridge, microwave and small oven. When opened the kitchen table can host six diners comfortably. In each bedroom there is a closet, the beds can be made as two twin or queen size. In the main bedroom there is a TV. The lounge room has a comfortable sofa that can open into a double bed. Amenities included in the apartment are; air conditioner unit in the lounge, WIFI, Cable TV, washing machine, safe, iron and hairdryer. this is the second time I have stayed at a Colony Suites apartment, Both times the apartment was exactly as offered, location was great, the owners are responsiveness and very helpful. I will stay with them whenever possible in the future. We stayed in The Colony for 5 days in November and had a great time. The apartment is spacious and very well maintained. It is very close to Emek Refaim which is a lively area which has lots of restaurants and shops. It's about a half hour walk to the Old City but a quick taxi ride away. The apartment was very reasonably priced compared to the very expensive hotels in Jerusalem and you have the added bonus of being able to be completely self sufficient. Linda is also a pleasure to deal with and always responded very quickly to requests or questions. Would definitely recommend staying there. We had a 2-bedroom apartment in the German Colony. It was in a great location, just a few blocks off the main street, so lots of shops and restaurants in easy walking distance. We had rented a car and it was easy to find free parking close by. The apartment rooms were clean and of good size and we took advantage of the kitchen and washing machine. The site manager, Linda, was very helpful. She came over to help us when we had a problem figuring out the safe and made calls on our behalf to secure us a taxi at a reasonable price to take us to Tel Aviv at the end of our stay. This is the second time I have rented an apartment from Colony Suites. Each time the service, responsiveness, cleanliness and accomodations were great. I will continue to use them whenever I can. The apartment was walking distance from everything that one would need, supermarket, coffee, restaurants etc. Owners were kind and extremely responsive. The 2 bedoom apartment on Yehoash was clean and fully stocked with lots of dishes , cooking utensils and a washing machine. Location was amazing!!! There was one sofa - we wished there were a few more comfortable chairs, and it would have been nice to have a desk. In hindsight, the owners probably would have brought them, if we had requested them. The neighbors were very friendly but noisy at night. I stayed twice-one week with my family in a 2 bedroom apt and one week in a studio.Location could not have been better Both were clean,well equipped. Linda was pleasant and helpful. We were concerned at first that a fully furnished apartment in one of Jerusalem's trendiest Cafe and restaurant neighborhoods would be noisy. We were wrong. The Colony is on Emek Refayim in the heart of the German Colony, but set back from the hub-bub of the street and is a peaceful and green oasis. Lynda who manages the property is excellent and keeps the property in tip-top shape and responded immediately to all our needs. She was a great source of advice on travel and many other matters not related to the property. We spent a week in a two-bedroom apartment and enjoyed our stay very much. It is a wonderful neighbourhood in walking distance to the Old City. Linda was a very helpful host and the rooms were perfectly clean and provided everything you need. We would definitely go there again. We enjoyed our stay in Colony #5. The owner is very helpful and everything was as advertised. You might bring slippers as the tile floors are all tile. The water heater is solar (common in Israel) but we never had it run out of hot water.